Going to Walt Disney World without the kids was one of the most fun vacations that we've ever had. It wasn't the most relaxing getaway but it was fun. This was the first time we ever traveled without the kids. Both of them are in college now. (One daughter is actually in graduate school!) So, we decided they were old enough to go it alone for awhile. One of the reasons why we went to Walt Disney World without the kids was because we could. As empty nesters we have the freedom to be ourselves on our vacations. Walt Disney World even has pet boarding so our vacation had absolutely no constraints. Being able to do what we wanted to do was a big part of the vacation. We were without whiny teens who wanted to go one way and then the other. Hubby and I were able to take in the shows at Walt Disney World instead of being dragged to the fast moving roller coasters. We love the Walt Disney World characters as much as the children do. I'm not ashamed to admit it. 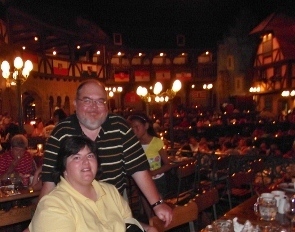 Dining at the Crystal Palace in the Magic Kingdom is something we got to do without kids. When other children acted up it was nice knowing that our kids were at home. The biggest reason that we went to Walt Disney World is because we wanted to. Hubby firmly believes that it is the most magical place on earth. We were able to hold hands and giggle without having the kids call 'gross' on us. To me, that was the most magical part of all.